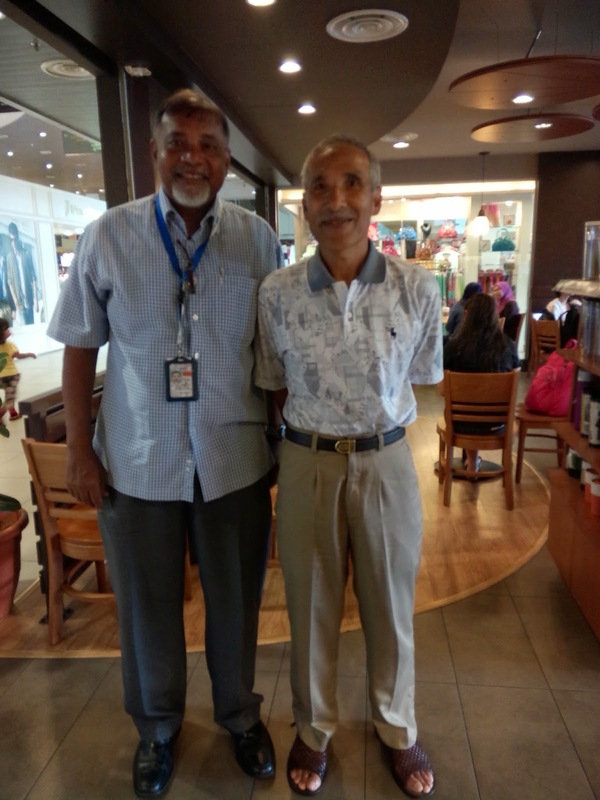 When I was in KL last month, click here, I managed to seek an appointment with Capt Dato' Revi Chandran of Island Air Sdn Bhd. The meeting was held at Starbucks, Skypark, Subang. Very fortunate of me indeed since his office is at SAAS Aiport itself. In fact, he paid for my coffee. The reason why I needed to talk to him was because he was the pilot who located the late James Tingom's Nuri which crashed at Gunung Gerah on 8/11/89 killing all the 21 POB. My name is Jacob Oommen. I was born on 11th August 1956 in Petaling Jaya, Selangor. I completed my HSC and joined the RMAF on 21st October 1975 to see the world as how they advertised it at that time. Little did I know that I was becoming a recruit and that I was going to boot camp before all my aspirations could materialise. I completed my training and then proceeded to RMAF Kinrara for mechanical training on Air Radar and Wireless. In March of 1976, I was posted to RMAF Kuantan and worked in the radio bay, 6&9 Squadron, ASF and 10 Squadron. I was very keen on becoming a pilot so in 1978, I applied for commission to be one. I got through the preliminary interview with the Base Commander Colonel Barney Chuah and then went to PD garrison for the subsequent interview with TKC. I got through all the way to the final board when I was then offered a commission in the Navy instead of the RMAF. I was given one day to think about it and to give the board the answer the next day. Since I very much wanted to become a pilot, I rejected it and returned to base. I was then told by the RMAF representative on the board to reapply for the next intake. In October 1979, I was selected to do my Technical training at RAF Cosford, U.K. and attended the course from December 1979 till March 1981. On my return from U.K., I was posted to AIROD where I was working in the Aircraft Division. I worked on the Nuri, Alouette and rebuilt the Bell 47G radio system. I also became a member of the salvage and repair team where we participated in the board of enquiries of crashes to determine the extent of damage sustained to airframes. 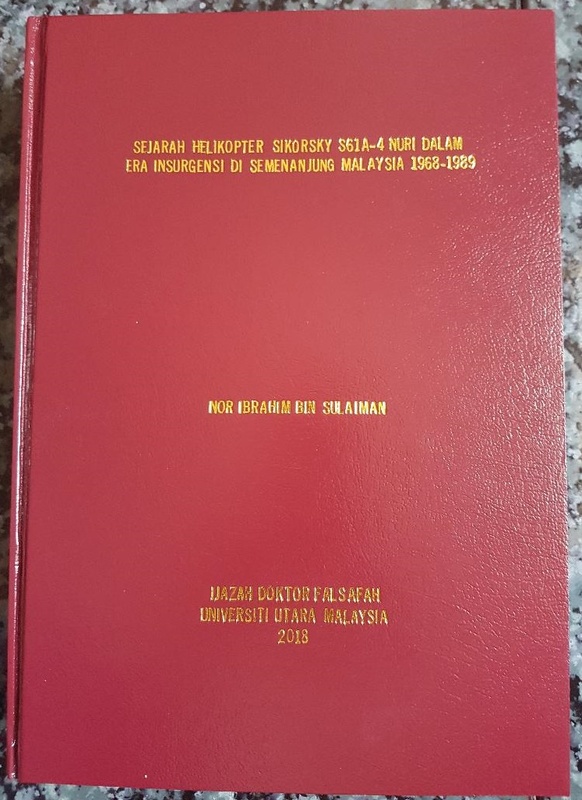 In 1983, I received a signal from TKC to apply for commission and so again I made it to the final board where I was told by the RMAF representative that they were not recruiting pilots and suggested that I apply for direct commission on becoming a Sergeant. I was promoted to Corporal within a year of coming back from U.K. I was now 28 years old and decided that if I was not going to make it as a pilot, I would at least be a part of the crew. I became a Nuri crewman in June of 1985 and was posted to 3 Squadron where I met Capt. Revi and many others. In May 1986, I was posted to 10 Squadron and remained on the Nuri fleet until August 1987 where I then converted to the Alouette. In the time I was crewman on the Nuri, I had several opportunities to fly the aircraft from the co-pilots seat. This experience drew me to join the Alouette where there was more opportunity for hands on flying. I had 2 very good instructors who taught me a lot about flying and they were Capt. Revi and Capt. Norizan. They awoke the spirit within me to achieve my dream of becoming a pilot. But alas, as a senior student to take up flying at the ripe old age of 34, I knew that it was going to be a struggle with finance and aptitude. When I wrote to over 30 schools around the world and found out the cost, I gave up my dreams and decided to sign on from 15 to 18 years. Capt. Revi on finding out that I had signed on convinced me that I should pursue my dream and withdraw my application to sign on. Major Sim K.P. was instrumental in helping me withdraw my application. I got Capt. Revi and late Capt. Rahman Abdullah to come home to speak to my family. The decision to become a pilot was going to cost me a lot but my family was convinced and supported my decision. The only place that I could afford to do my training was Chopperline Flight training at Caloundra, Queensland, Australia. I was also trying to get a scholarship and so in August 1990 , I travelled with my wife and son to the training school to assess it and at the same time to see if I could do less flying hours with my experience. The CFI, Capt. Tub Matheson, took me up in a Robinson R-22 with a handle bar cyclic and went through all the motions that a student would go through including engine off. He was very impressed with my flying ability, thanks to my 2 instructors, and he spoke to management and said that within 40 to 60 hours I should be able to get my commercial license provided I passed all my CPL exams. I was overjoyed at this result, and when I got back to KL, I relayed the news to all. I approached Captain Peter Wong of MHS at that time and asked him if he would sponsor me and in return I would serve the company for whatever time period placed on me. The company did not sponsor me, as it had never done it before, so now I had to do it myself and it meant having to sell all that I owned, most especially my home. Capt. Yahya of the DCA also had a big part to play in my career as a pilot. He guided me all the way and I kept him abreast of everything I was doing. In February of 1991, I left for Australia to do my flying training on my resettlement. It was never ever done by any other airman, but I convinced them that my family’s life depended on me succeeding. Every step of the way I kept sending my progress report to DCA and VETERAN. I had only RM 60,000/- with me and by the end of April I completed all my exams with Distinction. I started my flying phase in May and completed my Australian CPL flight test on August 10th 1991, one day shy of my 35th birthday. It was a wonderful present and I thank God and my family’s trust in me. I then continued to get my turbine endorsement on the Bell 206 J/L ranger and also my sling endorsement with a view to start working in Papua New Guinea with either Pacific or Heavy Lift as a co-pilot. In mid August 1991, Capt. Peter Wong DFO of MHS enquired with Capt. Yahya about me. He told him that I had completed my Australian CPL (H) and was looking for a job. MHS was now short of pilots and were employing co-pilots from India and so he wanted me to put in my application to MHS. I joined MHS in September of 1991 and was sent to Dallas (FSI ) for my conversion on to the Bell 412. I am grateful and thankful to Capt. Revi, Capt. Norizan, Capt. Yahya for enabling me to achieve my dreams and Capt. Peter Wong for my first job as a fully fledged Commercial pilot with MHS. I worked with MHS at their Kerteh operations from October 1991 till May 1994 and was dual rated on the Bell 412 and S-61N. In June of 1994, I was sent to Stavanger, Norway to do my conversion on to the AS332L1 Super Puma. On my return, I was posted to Miri to fly for Shell Operations, Sarawak. In April of 1998, due to personal reasons, I decided to venture overseas. I applied to join Bristow Helicopters International, U.K. In May, I was offered a job with them as a year 2 Captain for their Nigerian Operations to fly the Bell 212. I accepted the offer and reported to Redhill Aerodrome, Surrey where Bristows Headquarters was located. I did all the available courses there and a differences course on to the Bell 212 and was shipped to Nigeria on a 2 year contract. It was a colourful place to fly with all the dangers, but rewarding. 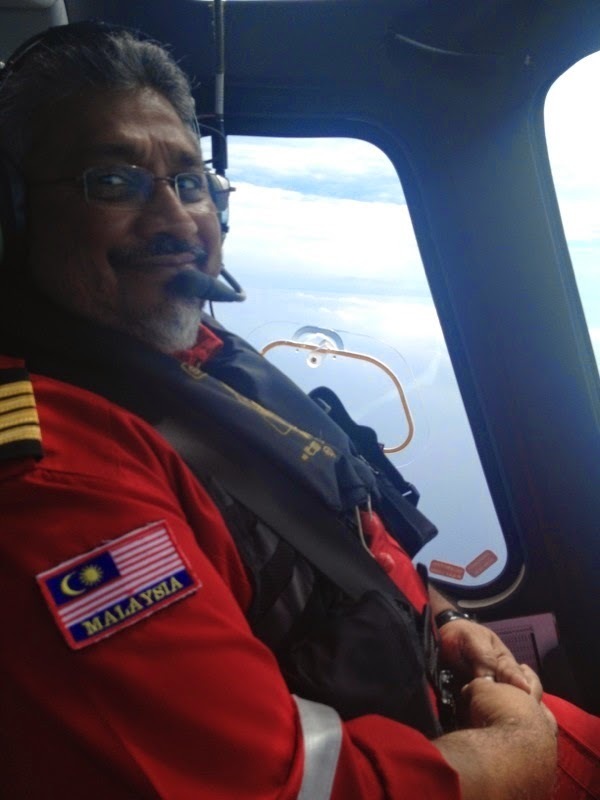 When my 2 year contract came up, I was now accelerated to year 6 Captain and this nw paved the way for many more Malaysians to be accepted into Bristow Helicopters. I had a very memorable career with Bristow helicopters flying with pilots from all over the world and forged lasting friendships. I was with Bristow Helicopters Nigeria for 12 and a half years and left as a year 16 Captain on December 31st 2010 to take up a job with Weststar Aviation of Malaysia. To date I hold a current Malaysian ATPL, Australian ATPL and Nigerian ATPL. I joined Weststar Aviation on the 1st of January 2011 as a Captain on the AW139 and am now based in Songkla, Thailand for their International operations. I owe a ton of gratitude to a lot of people who helped me along the way but most of all to God. I am what I am because of God’s grace and I am humbled by his abundant blessings bestowed to me. Thank you for this opportunity to write this article and I hope that others may be inspired and encouraged to fulfil their dreams and to never give up. My father used to tell me when I was growing up that “Failure is the stepping stone to success” and I have kept that to heart throughout my career. Well readers, when there is a will, there is a way. You plan your future, but of course, never ever forget God has the final say. So inspiring! Terima kasih Mejar Nor atas perkongsian ini. What an inspiring real life experience !! Excellent motivation to those aspiring to become pilots. Salute! !